The winners of the big show in Paducah are online at the American Quilter website. Enjoy. I had nothing to say today... So I decided to read around the ring (After my computer finally started to work at about 9:50) first. Well wouldn't you know, Vicky of LA Quilter blogged about her getting into quilting... & I decided that I could too... Sort of! 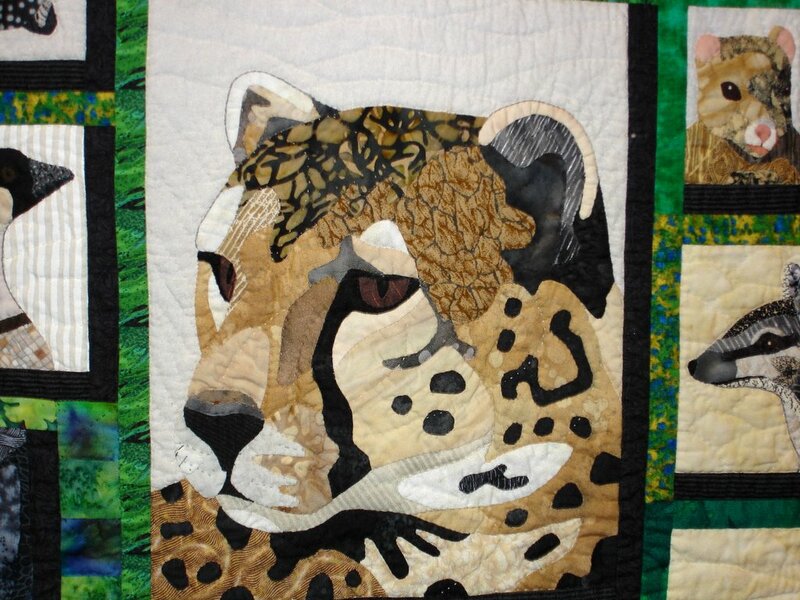 After creating innumerable charms, I searched the internet for a "quilt guild." (No idea how I knew there was such an animal.) & joined right up! 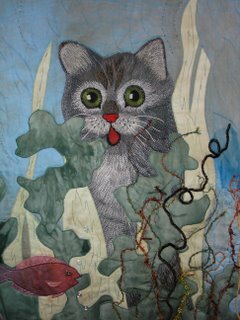 I also signed up for the first class that they had - applique with Karen Kay Buckley. Boy was I in over my head. (I bought the WRONG fabric at Joannes, etc.) I learned a lot - the best thing was how to keep my needle on the top of the project. (I had been a cross stitcher - remember & this was my FIRST quilting class.) I bought her sampler book. I was reading all kinds of library books - but adamant not to do it the "TEMPLATES" way. Please do share you beginings - curious minds want to know! A note on the quilt show photos... My husband Michael (the saint for going to quilt shows with his wife) & I went to two local shows on Saturday in the rain. 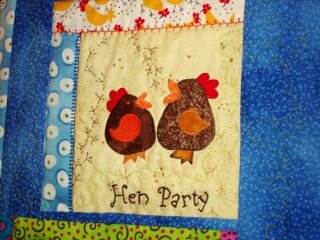 The first was my old guild Faithful Circle Quilter's in Columbia, Maryland, it was nice to see so many familiar faces and to catch up with some of the gals, but I did not take any pictures... Not sure why, I had my camera... Plenty of nice quilts & great vendors. (one of my favorite vendors, a hand dyed lady "The Dyers Edge" gave me a free piece of shibori as a wedding gift, now I want to think of a "Stunning" way to use it!) 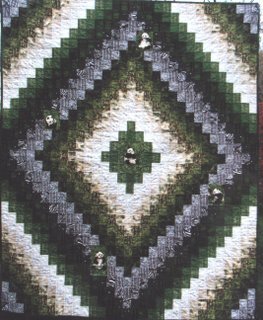 I got a fat quarter/scrap friendly pattern - that I mentioned on Monday - called "October." 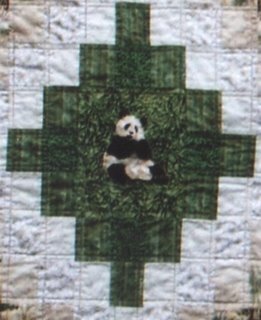 Our quild had Norma Campbell teach Trip Around the World & there were plenty of finishes to prove it, but a trip around the world is A Trip Around the World... (I already shared mine here!) The second show (after a shopping excursion to Wal-Mart) was in Gaithersburg, Maryland & there are photos from it below... I also got some great cat fabrics at this show - as if I needed any new cat fabrics! 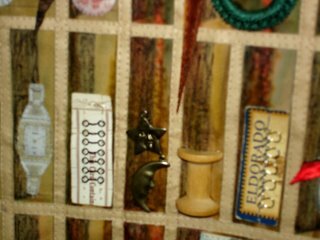 >^..^< href="http://www.jankrentz.com/workshops-supply.php?ID=13">Jan Krentz's Spiral Lone Star idea. This is the last post on the Friendship Star Quilt Show in Gaithersburg, Maryland. 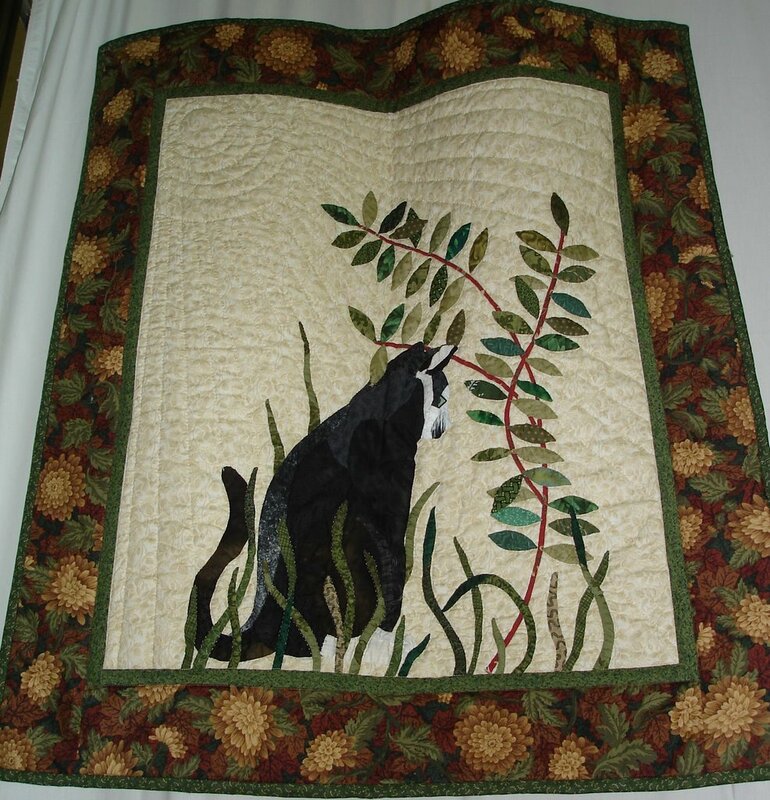 I am post the one because, DUH it is a cat quilt! (I almost bid on one at their silent auction, but it was already bid about my limit...) The Quilt is called "Karen's Kitten" by Sandy D'Angelo, the pattern is by Carol Armstrong - I own it.... I like the autumnal feel that the border gives it. The other picture I captured more for the "Similar but Different-ness" of it. 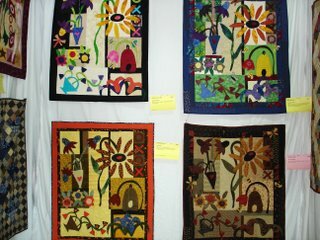 The quilts are the product of a guild worshop withPat Sloan. 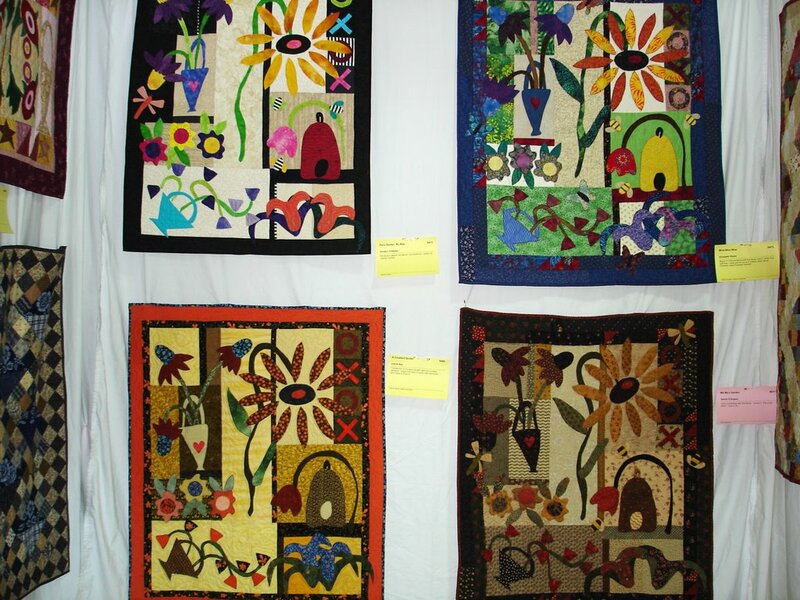 Clockwise starting with the top left "Pat's Garden, My Way" by Coralyn Colladay, "Mine, Mine, Mine" by Elizabeth Plantz, "Ma Ma's Garden" by Sandy D'Angelo & "A Constant Quilter" by Laurie Bay. See you really can take a pattern and make it your own! Any comfort foods out there? Any good recipes to share? 2. 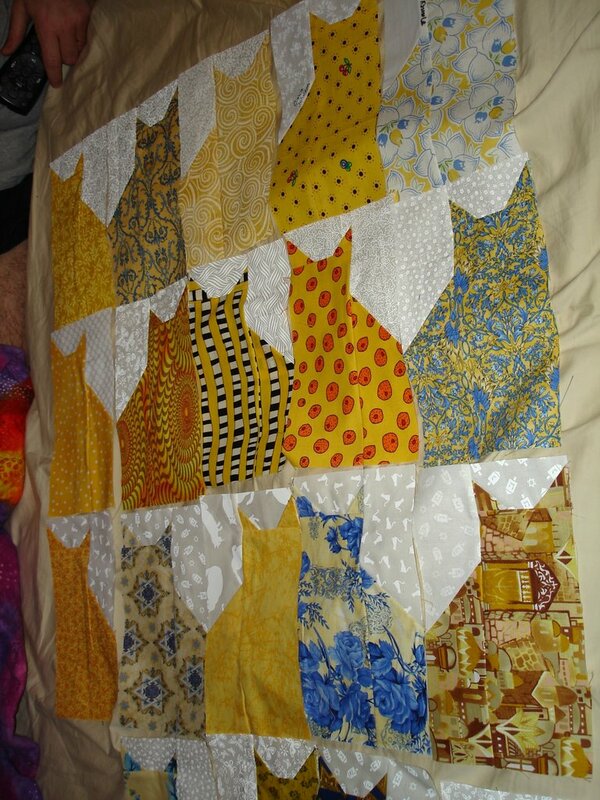 I generally have a plan for fabric scraps from quilt number 1 before I have even cut into said quilt number 1. 3. I like flat soda just fine. 4. I talk to my cats & I understand what they say to me. 5. I don't like to talk on the phone. 6. I don't shave my legs. If you want to try feel free, I won't tag since so many of you have already been tagged or read them and chose not to steal it. 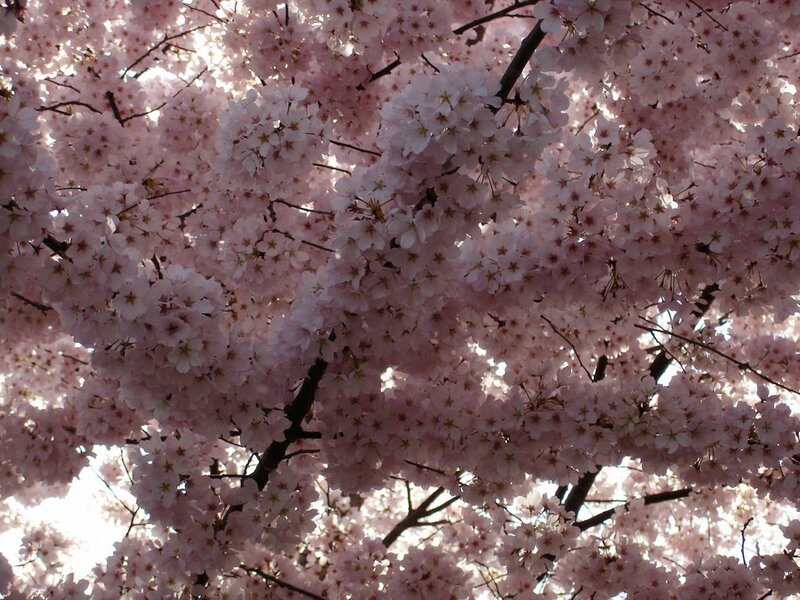 It was harder that I thought & my husband had a long list, but I am not conviced that all of them were wierd... Annoying maybe, reflection of where we live maybe, but not "wierd." 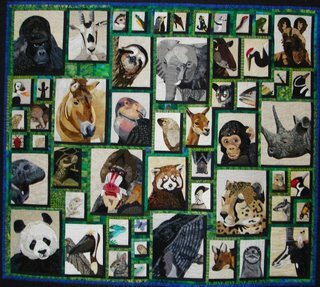 Take a look at this quilt! Is that not the coolest thing even if it is not your Alma Mater - its not mine either. Those are all squares, no 1/2 square triangles and no applique! She fussy cut to get the curves - you can see it best on the foot closeup. I also caught some of the "messages" I love that... Very Subtle! 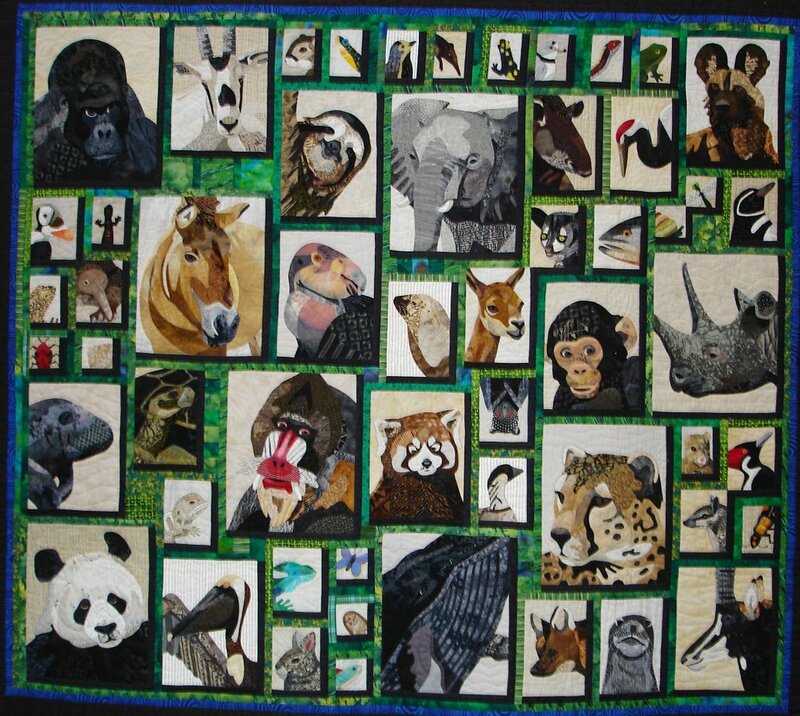 BTW there are about 5000 squares in this quilt! It is called "John's Turtle" by Susan Holman, member for the Friendship Star Quilters in Gaithersburg Maryland. 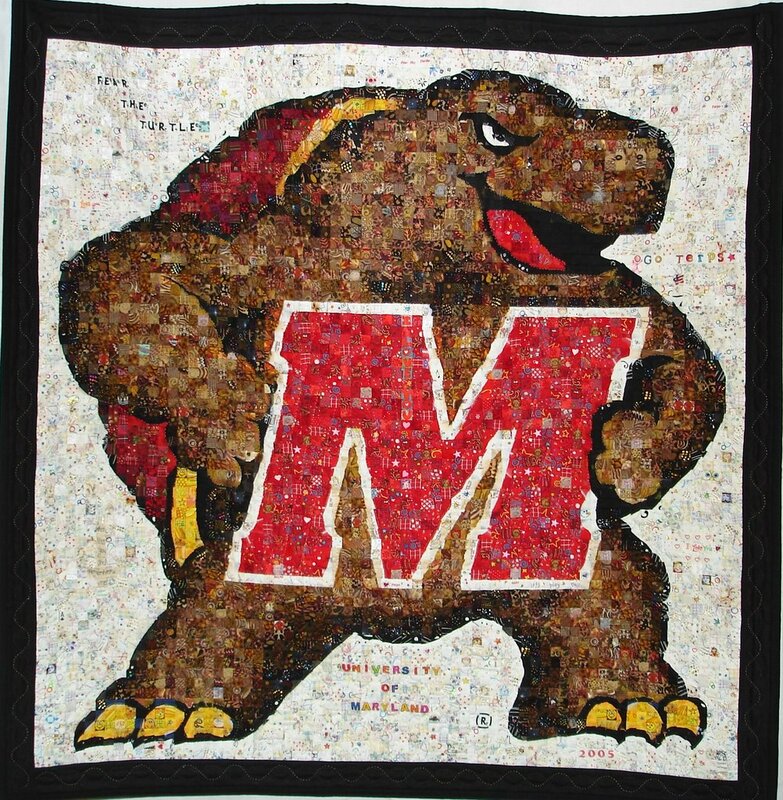 John is the quiter's husband, they both are alumni & their son is a current UMD student. 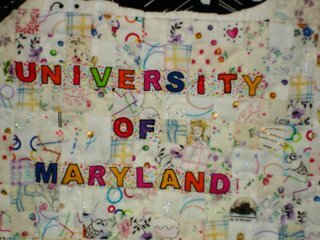 Now I'f I were talented like DebR, I would write on the picture an arrow shoing you the "real" turtle below to the right of the "D." & You'll notice how she also fussy cut (I loves me some fussy cutting!) Ghost faces for the light smiles... Just out of that frame is the "trademark" logo - you know the "R" in a circle - she pieced that too using about 5 blocks in her grid! (Fussy cutting to get the circle arcs no less.) 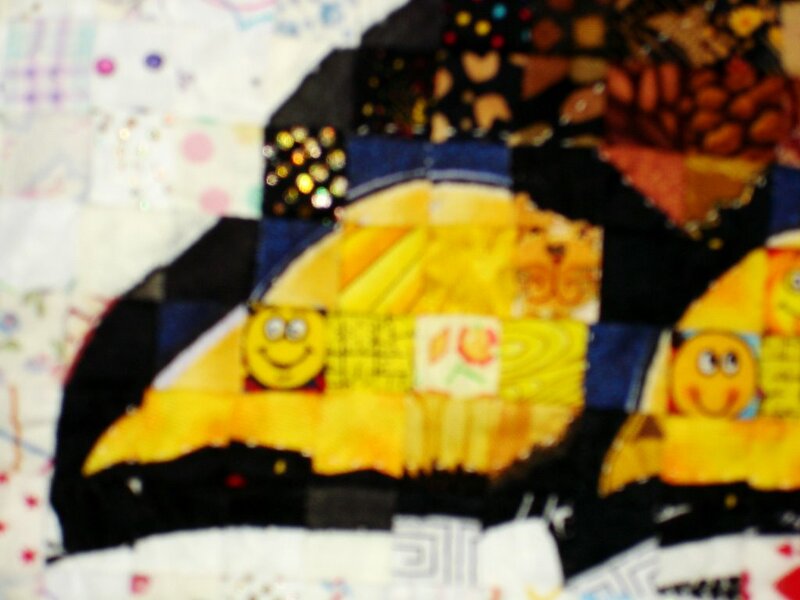 You can "see" it on the whole quilt picture. What created that you may ask. This lovely is the creator of the mess! This is a cherry blossom, but not "the" cherry blossom. 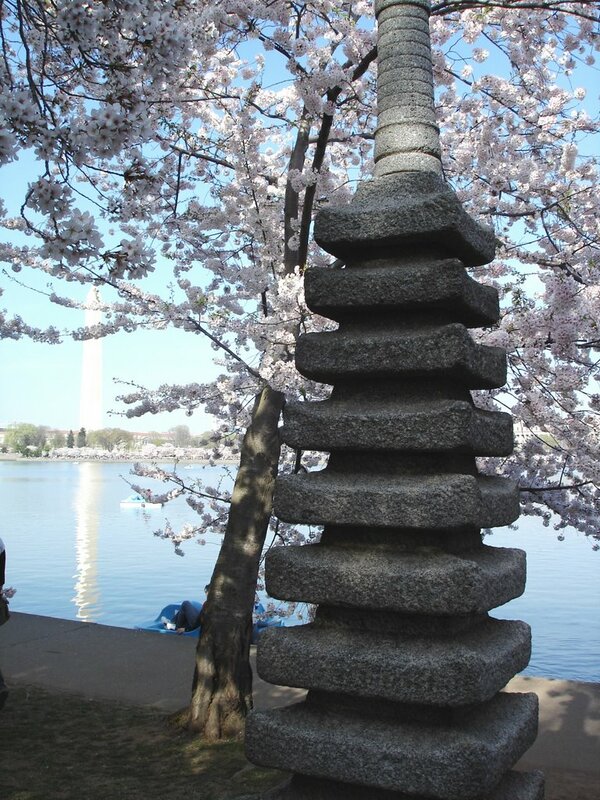 "The" cherry blossom is more simple in structure & less messy IMHO. I was 14 - enough said! I college & working as a cashier for a grocery store. 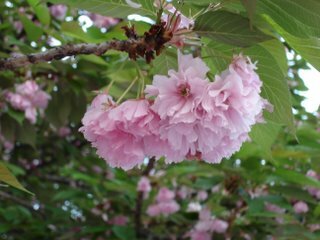 Major du jour: Nursing, I changed many times, ended up leaving with an Elementary Education degree in 1997. In a long term relationship that did not pan out for one reason or another - maybe because he was (he still is) an only child and an Adult Orphan. I am the oldest of two & while I don't buyin into the birth order concept completely, I can see some of it crystal clear. 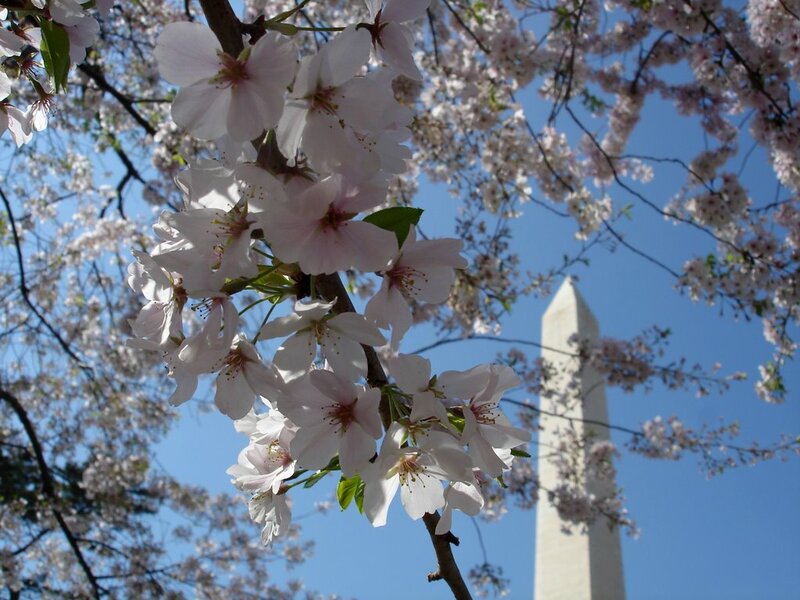 Started to work at Social Security Administration. (Was finally able to quit the "while in college job" which BTW paid better than teaching full time.) In the middle of yet another long term relationship with a middle child - enough said! I started quilting about this time. I bought & sold a condo in the middle here and was in yet another long term relationship. I started blogging somewhere in here. I was married for about 1 month - it felt and still feels the same as before because we lived to gether in a tiny studio and we are still in the studio. Work was the same, I got a brand new sewing machine, but was in a "drought" creatively speaking. I finished a quilt top and back & made a label for it all with my new machine. It will be a gift. For my BIL if he straightens up! Let me get through today! I'll tag Jeanne, Sam, & Mary. 1. I got gas for $2.97 on Saturday & felt like it was a GREAT deal. How sad... (Everyone thought it was a GREAT deal, there were LINES!) We had some miscommunication with another driver, but it all ended up o.k. - Miscommunication, need more: I went around so that I could pull up to the pump with my gas receiver spot on the correct side. Meanwhile a guy ahead of me did not, but I did not know that. Said guy, pulled up (to turn around, but I thought to drive away...) so I pulled all the way through (to the pump where the other guy already paid $15 for gas, oops. He was never able to say, "I already paid." He said stuff like, "I can pay before and be done before you pay, while I would say, but my husband is already paying...) allowing the truck behind me to also pump gas. We got our gas & the guy who already paid got his gas and nothing really bad happened to either of us. Thankfully... If the situation were reversed, I would not have acted so nicely, but I would have been able to say, "I already paid. I was only turning around." 2. New car tail-lights.... Have you noticed that once upon a time ago they were comprised of 1 light bulb and a red piece of plastic? Now they are a lot of tiny lights. Well, I was diving behind an "Infinity" car, and the tail-lights - create the mathematical sign for - wait a minute.... Infinity! I kid you not. I can't find a photo depicting this, but I swear it is true.... Maybe it was one of those "special things" that guys do to cars... Like replacing the red plastic with white and the white light bulb with red on regular tail-light cars. 5. Project Spectrum... You just read that I did not sew down my flowers, but I did cut out my background squares, they are all "floral, leafy, viney, etc." 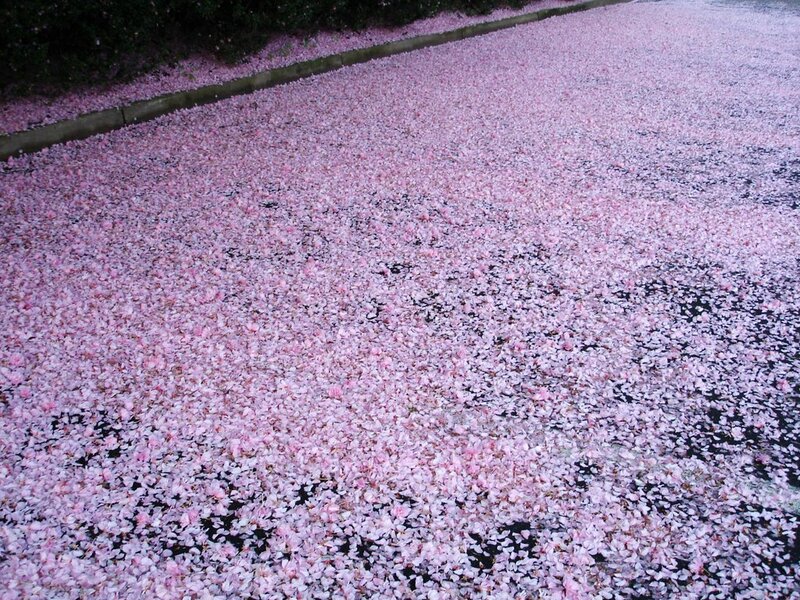 to go with the flowers... Clever huh? & At a local quilt show, I got a pattern that will help me to use up the scraps from the flower quilt! 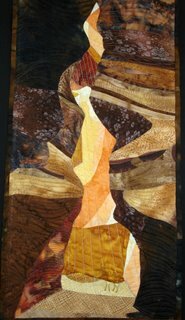 It is called "October" and is a strippy neutral background with appliqued autumnal leaves... I have already cut the strips and sewed a few "Leader-Ender" style while working on the homespun project. Mine will already be a bit different, call me a REBEL quilter! First, this is my Project Spectrum preview. I need to cut out the neutral background squares (good thing I use cream colored sheets...) and sew them down ala Bull's Eye. Which Is why I "need" orange thread. Second are Daiwabo Taupes which will become a traditional albeit scrappy card tricks quilt. Read more about the taupes if you like at Pinwheels. 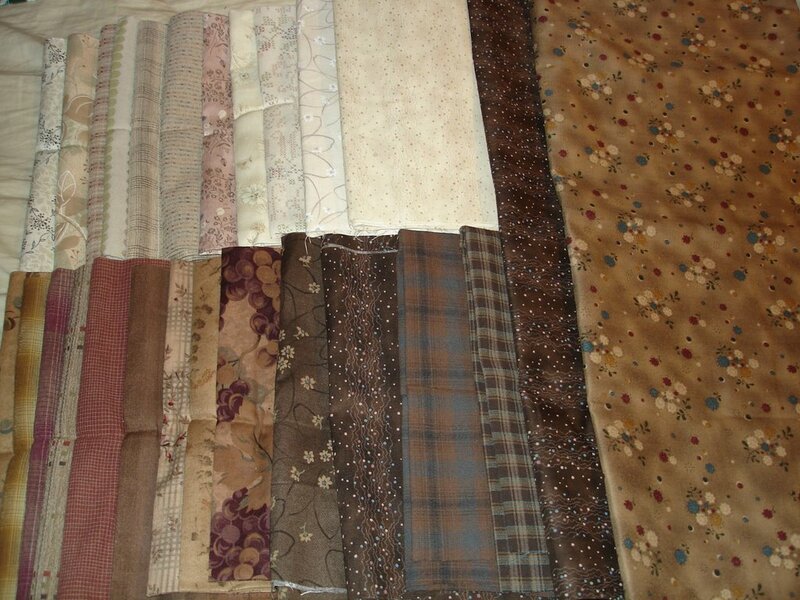 I bought most of these at the Lancaster Show after lusting after them at the Mid-Atlantic Quilt Festival. But I supplimented my earlier purchase with a couple more cuts in NYC. I also got the gnomes and gold fishies in NYC, I have no idea what I am going to use them in but I "had" to have them. o.k. now I can read my e-mail... I had to get that out onto "paper" while it was still fresh. BTW I have my camera and my cable today - so look for another post with PHOTOS! Dawn went to the Chicago Quilt show & uploaded a ton of photos onto her webshots (please use the hyperlink to get to her blog & the webshots if you care to see them!) this was one of them. 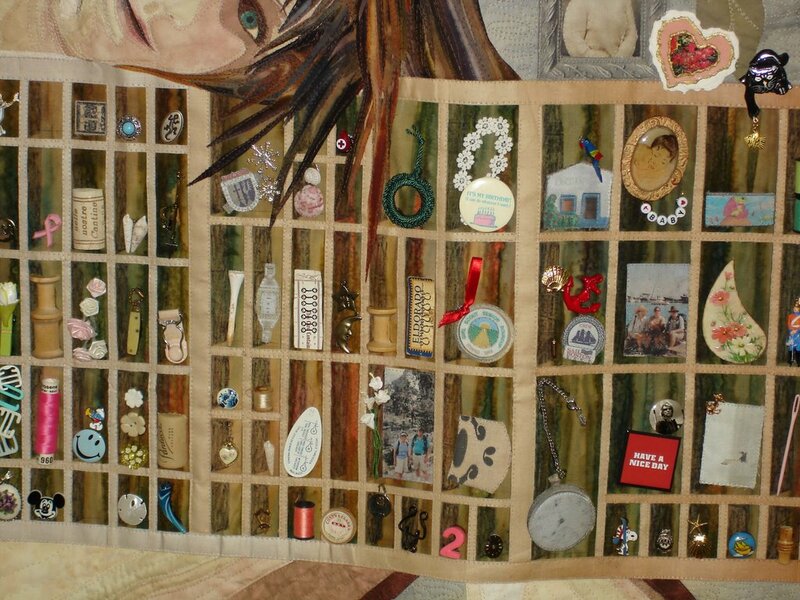 Sorry I have no idea who made the quilt but I love the setting! A fun "readability test" from juicystudio. How readable is your blog? The following table contains the readability results for http://thecalicocat.blogspot.com/ . Star Happy by Judy Martin. This quilt is one of my UFO's - mine will be an "exact replica" (blue & white/light - blue where you see blue & white/light where you see white/light) I got a crazy idea to cut out all of the pieces first... 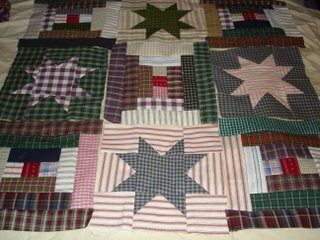 I also do not want to repeat fabrics with the blocks - that is about 16 different pieces per big block = double for the star in a star blocks! So I was in New York... (I forgot my camera today to upload a few photos.) I went to what has to be the tiniest quilt shop, but they had quite a bit of fabric - floor too ceiling & it was eerily organized... 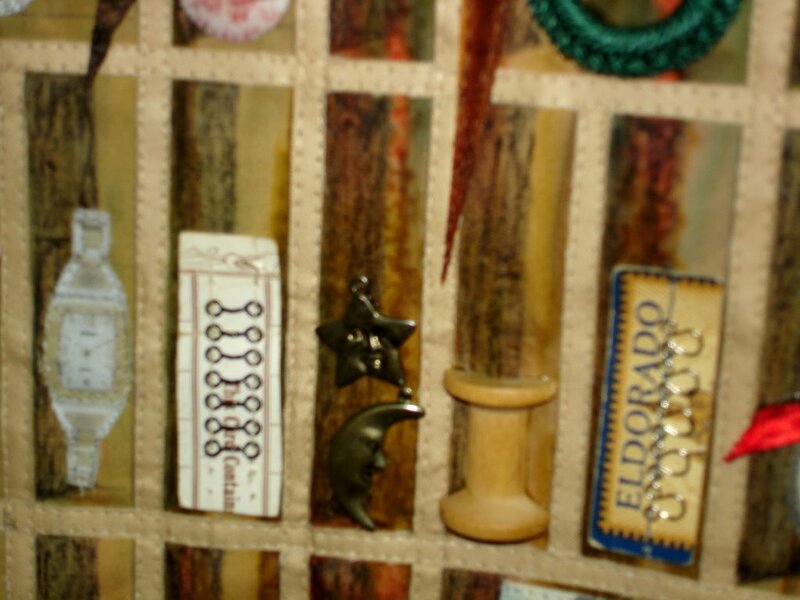 The "fabric flavor" of the shop was definately retro - back to the sixties and seventies. You can see some of the fabric that they carry here Flea Market Fancy by: Free Spirit. They also had a nice selection of CW repros and Daiwabo Taupes - I got a few of those. 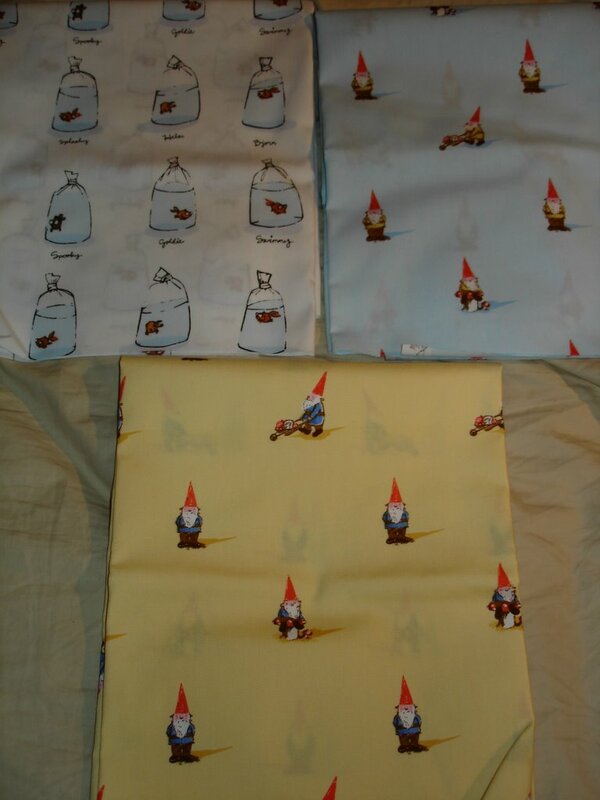 :o) I also got a couple pieces of fabric with gnomes and one with gold fishies. 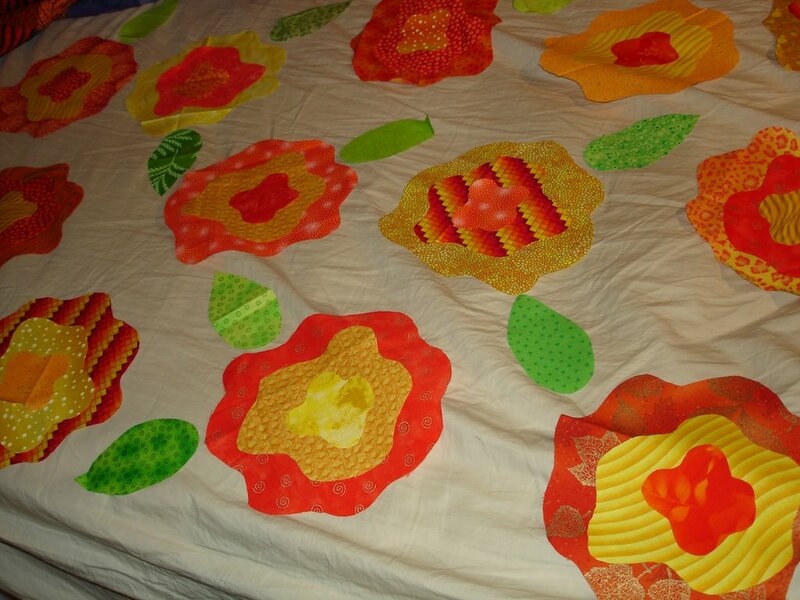 I got all of my flowers and leaves cut out for my April Project Spectrum Orange quilt: "Are Orange Blossoms Orange?" 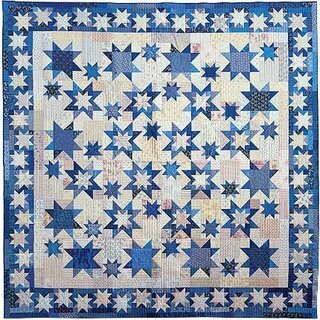 I also finished piecing my HomeSpun Stars and am half way finished with my CourtHouse Steps blocks. While in New York I was barely able to get onto the computer so I have a lot of catching up to do! 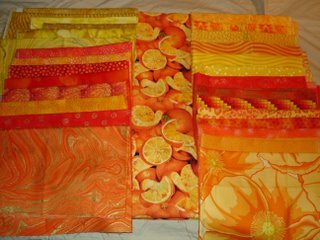 My April Project Spectrum quilt will use these fabrics. I will use the frayed edge technique like the bulls-eye blocks similar to those that Holly just gave away. 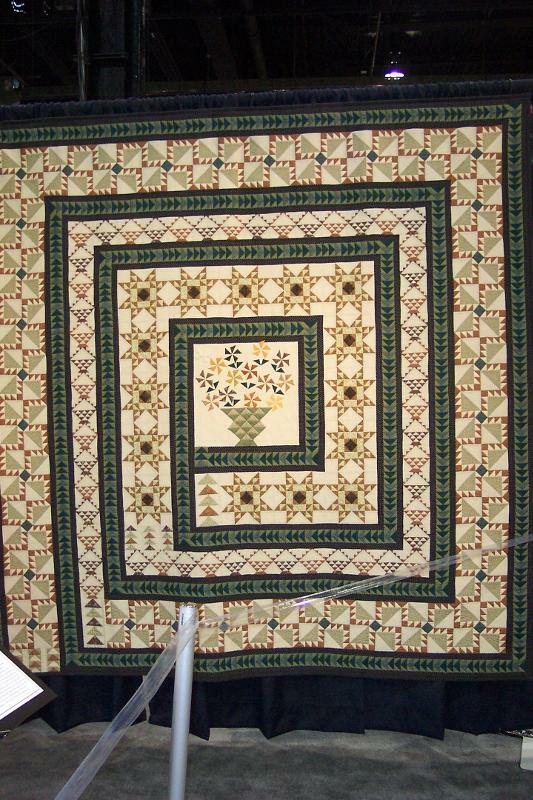 The actual pattern and inspiration are from McCall's Quilting & called Blooming Rose. I am making them along with Tambo. 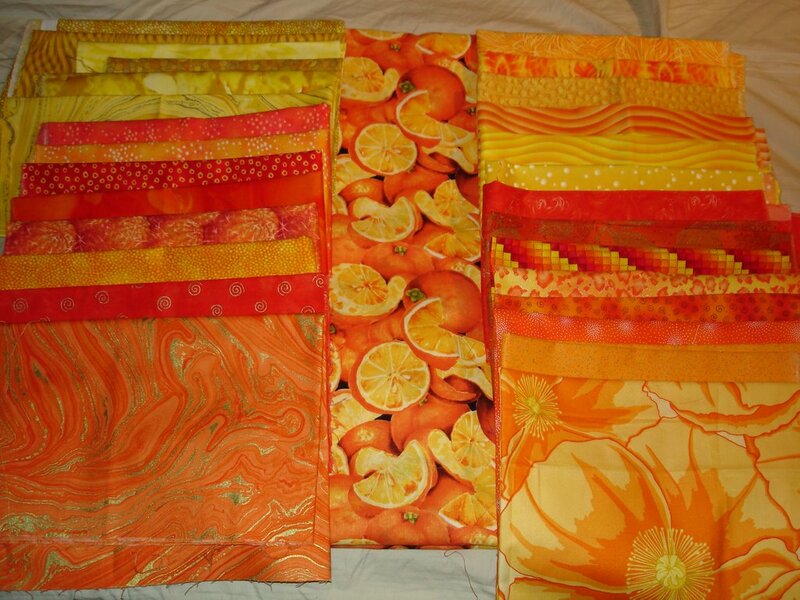 I was so happy to find the "oranges" fabric in my bright citrus value this past weekend. Previously I had only found lemons, limes and a print that has both oranges and bananas. (I could have used the banana one if it also had apples - and played with an old ditty that I used to sing in school. If you know what I am talking about, chime in!) The rest of the fabrics that are showing and my light backgrounds came from my stash. I will add lime green leaves - also from my stash. That will probably also be my narrow inner border. 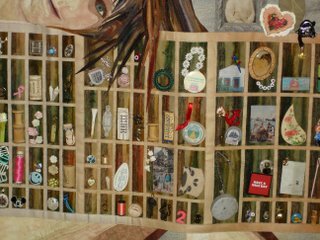 Since I am in the stash quilt ring, I though it was important to bring that up! 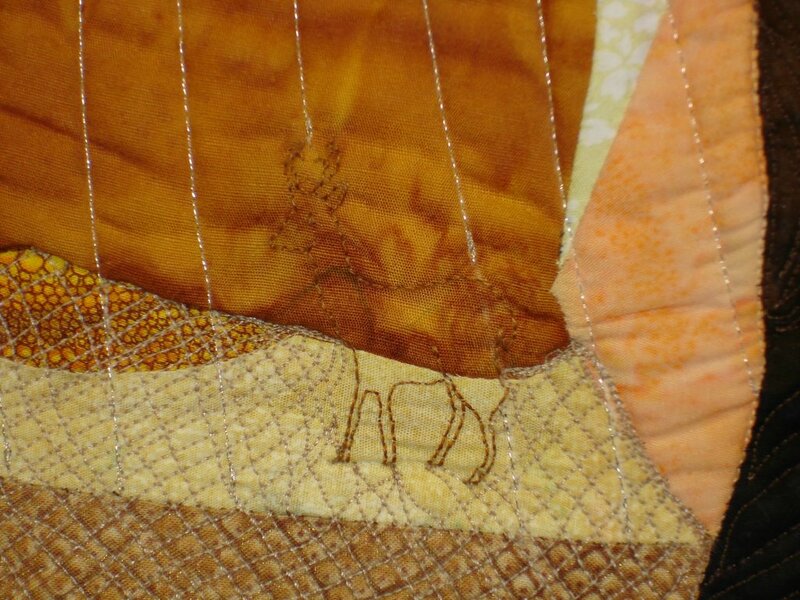 The backing is an orange geometric - I have enough for that to be the binding too. 1661 -Oliver Cromwell, Lord Protector of the Commonwealth of England is formally executed - after having been dead for two years. 1835 - A mentally ill man named Richard Lawrence attempts to assassinate President Andrew Jackson in the United States Capitol -- the first assassination attempt against a President. Both of Lawrence's pistols misfire, and Jackson proceeds to beat his would-be assassin with his cane. 1889 - Archduke Crown Prince Rudolf of Austria, heir to the Austro-Hungarian crown, was found dead with his mistress Baroness Mary Vetsera in Mayerling. How they died remains a mystery. Since tagging is generally part of the MeMe experience, consider yourself tagged! My prize purchase was enough Daiwabo fabric to make a quilt - I lusted after them at the Mid-Atlantic Quilt Festival a few weeks ago, so I was not going to leave them behind again! 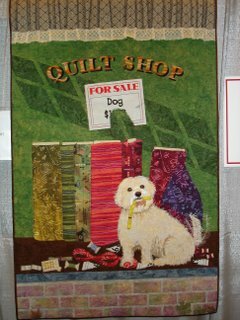 Another good thing was that I saw my buddy Kathy there & Boy was I happy becasue of it - she has been out of contact due to sickness, quilt classes, new phone that doesn't work, etc. So I was worried about her! She is on the mend and ALIVE! 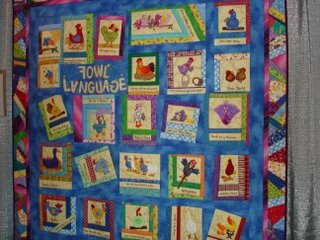 "Foul Language" by: Margie Engel of Satellite Beach, FL. 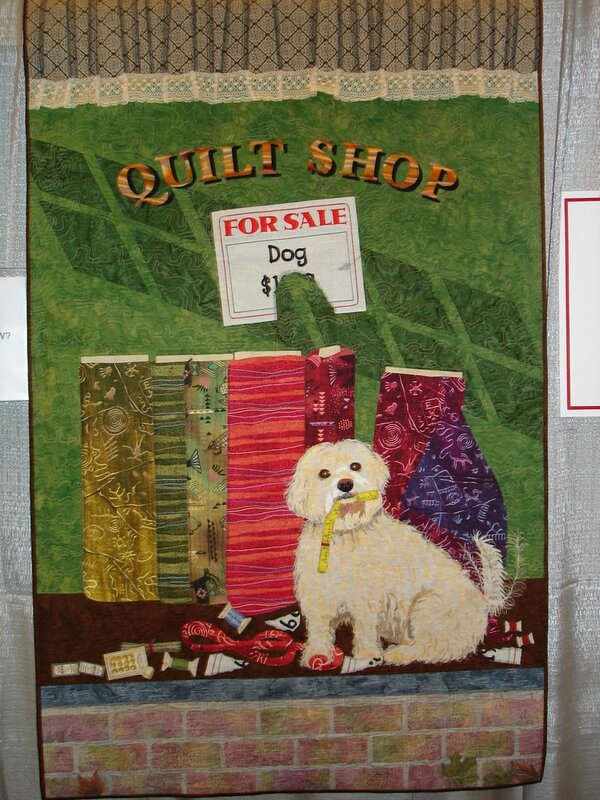 Out of the entire quilt show, this was my favorite quilt! 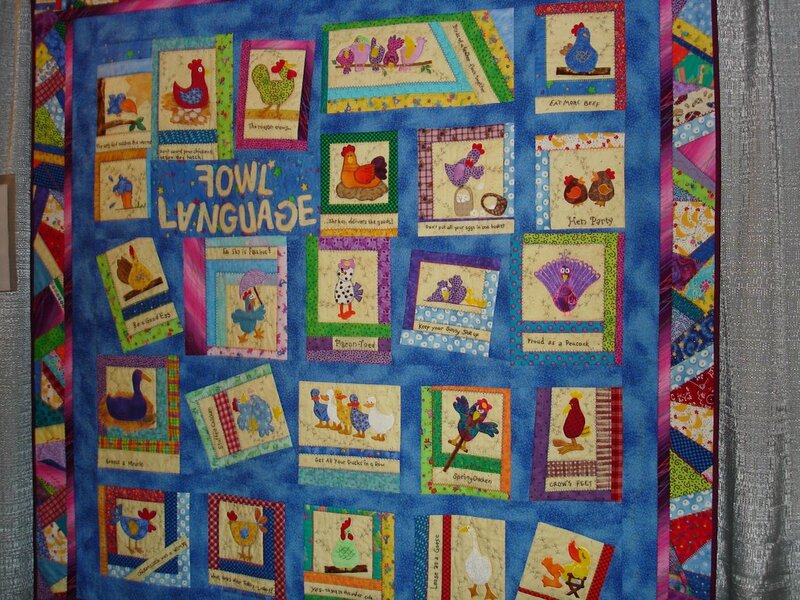 I really like everything about it, the fabrics, the quotes, the cute appliques, the quilting - everything. 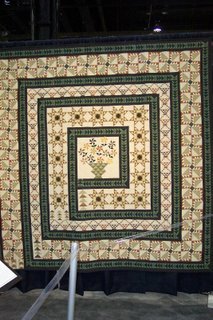 Unfortunately this quilt was in one of those 3 sided display areas and on the side, so my photos are less than successful. 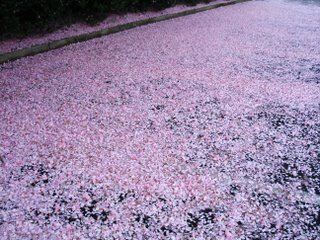 I would have gathered more close ups, if I were able. 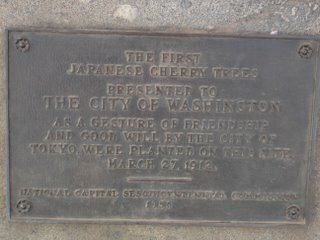 A few of the other quotes were "Pidgeon Toed," "Proud as a Peacock," & "Birds of a Feather." "Wanted" by: Nancy Brown of Oakland, CA. This quilt won a big prize. I love how the blocks are different sizes. I might use this as an idea on how to capture my Australia trip - one animal per block... I included a close up of the cheetah - one of my favorite wild animals. I would have gotten more close-ups, but there were a lot of people close to this quilt! I am happy that I got a people free shot! "Fish... It's Whats for Dinner" by: Joann Belling of DesMoines, IA. 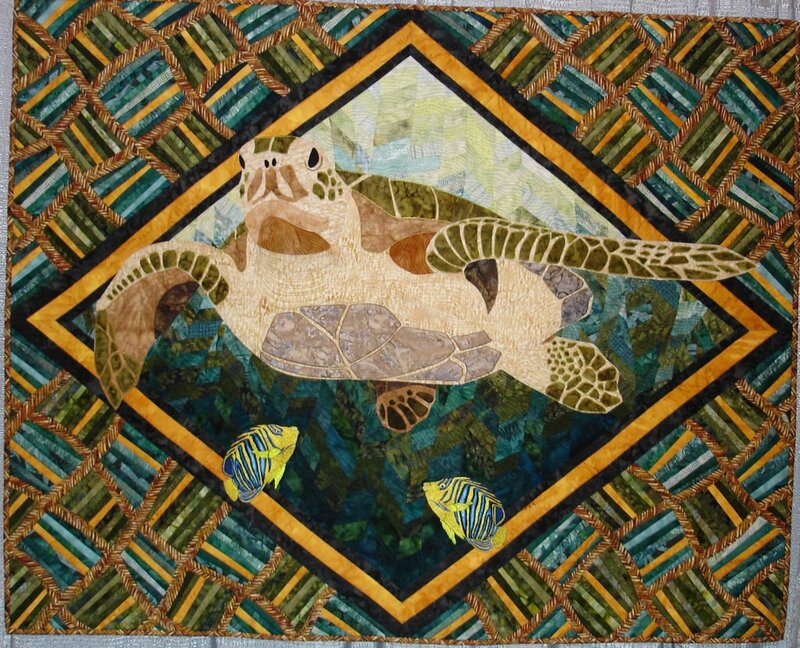 Close up of the Fish quilt. Equal access for the Dog lovers, here is "How much is that Doggie in the Window" by: Linda Ruess Benson in Mequon, WI. 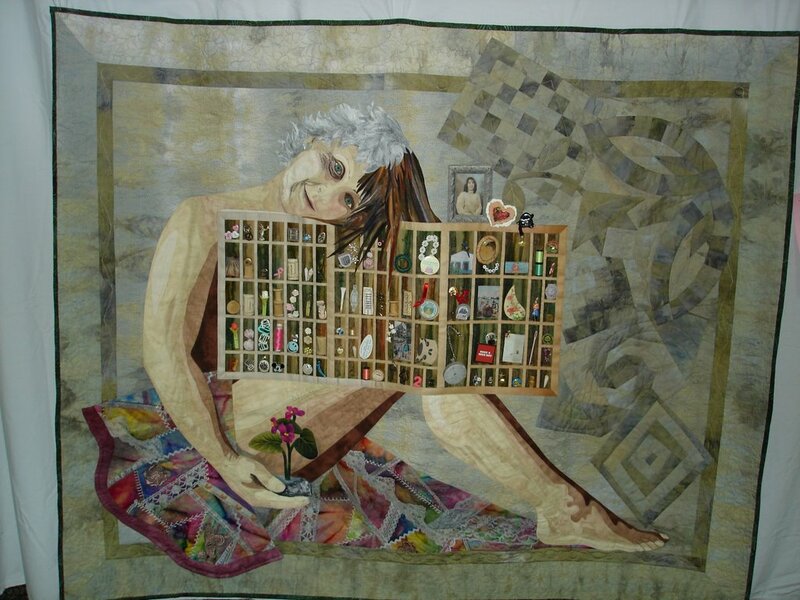 It was part of a special exhibit where the quilters used a song title for inspiration. 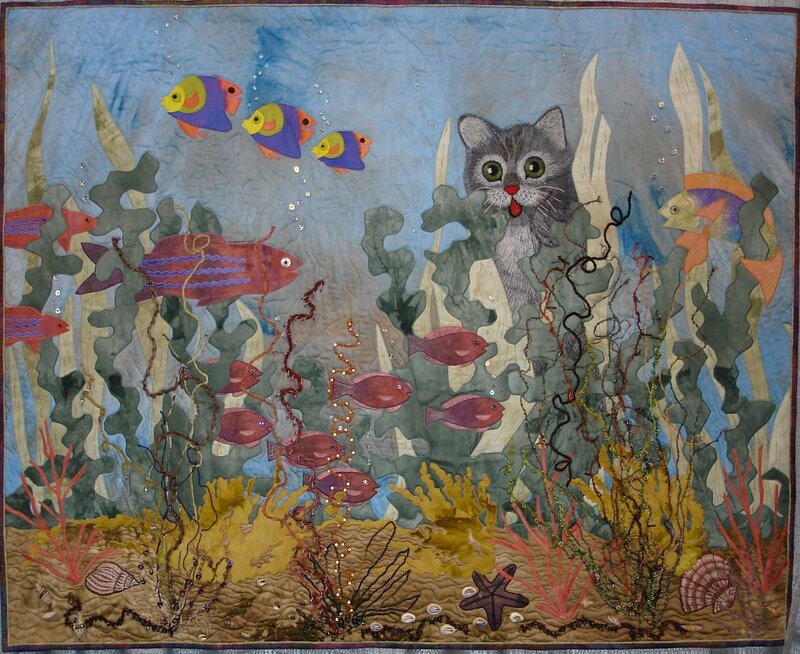 "Up from the Depths" by: Sue Turnquist of Kalamazoo, MI. 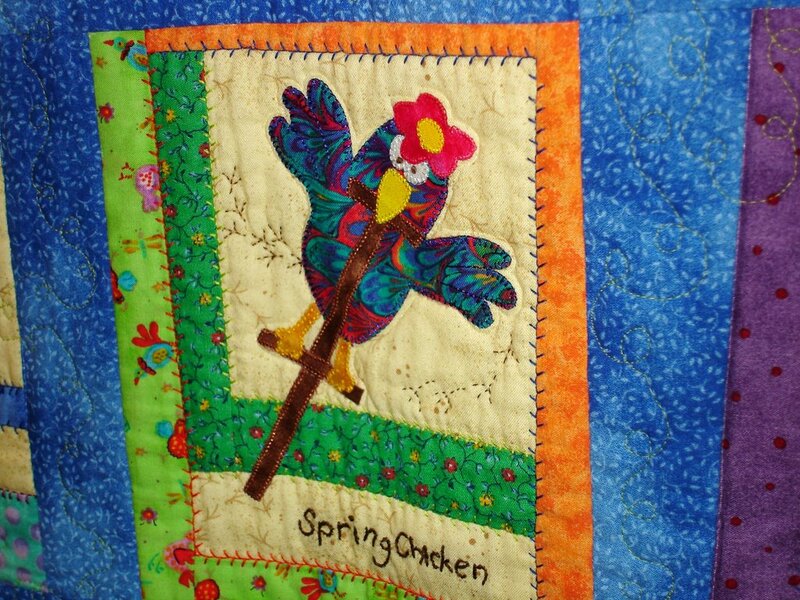 I love the background and the border on this quilt. 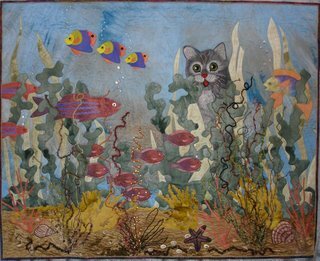 I also like how the turtle & fish are partially appliqued on top of the border, like they really are coming up from the depths. Close up of Antelope Canyon. What you want to see some blocks from that fabric that I cut yesterday? Well here ya go! So, the answer is finally YES! I finally sewed with my new sewing machine. I did have the bobbin in backwards - I did not realize there was a backwards.... so the start was iffy & I was nervous that I already broke it, before breaking it in! But I fixed that & got her going & I sewed up 4 blocks! I am also sharing my "stash of homespun" - I so hope this quilt uses it all up! This is my Dephi challenge piece. Is is masculine enough? Does anyone else have a cat who likes to "help?" Yes, my little boy RB will roll all over any blocks that I layout. I decided to do a stars and court house steps quilt. 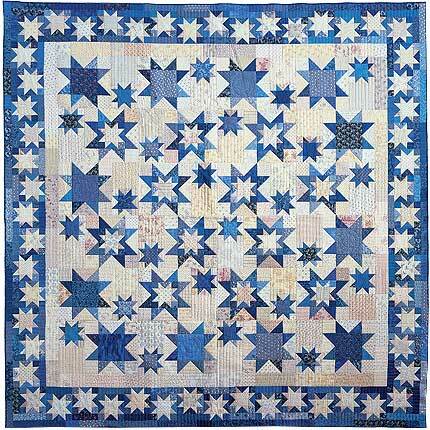 Some of my stars will be dark on a light background & vice versa and by virtue of the nature of the court house steps block, when they come together there is a really cool secondary design & you know how I love secondary designs! 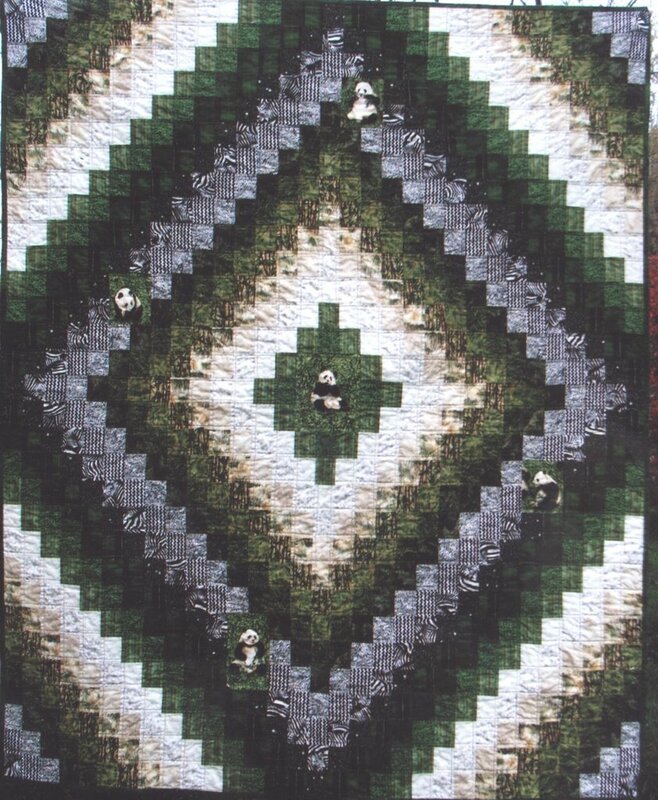 Since I accepted a UFO challenge at a quilters forum on Delphi & this is my randomly chosen project to work on, I hope to at least cut as much tonight too. I only wish is were orange, so it could be a Project Spectrum too! For that I am joining Tambo in making bulls-eye flowers. 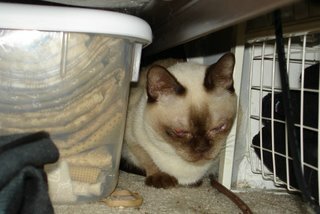 The last photo is of my "Mighty Hunter." He has apparently found his prey. 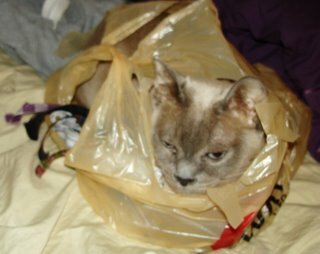 If I let him, he would have bitten on that bag until he could get to the cat food. (He did that to a bag of dog food even thought a full dish of cat food was available!) Which in one way is a good thing because it is expensive Rx cat food. 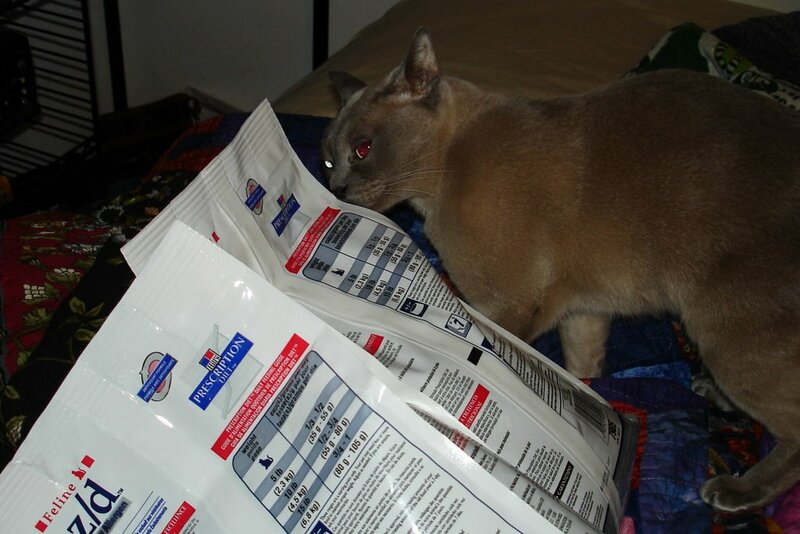 Rhapsody likes it too, but she has a different canned Rx cat food. I give her (with my vets permission) a few of his as a treat since she likes it so much. This intrigues my vet, becasue this specific variety of cat food is notorious for not tasting too good to cats - it is apparently bland. (RB is allergic to the proteins - beef, chicken, etc. - that are in "normal" cat foods.) He sneaks bits of hers by cleaning her food bowl, Bad RB, but he has a bad mommy who will give him tid bits of people food, because he takes so nice... I did mention that he is a mighty hunter. 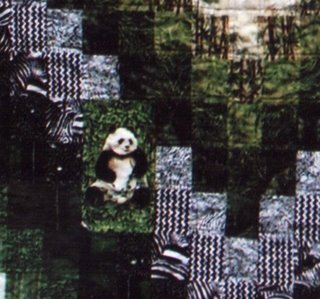 Is that a Panda in your Trip Around the World? I also like the fabric choices, but I always do like Beth's choices - she has a great eye for which fabrics to use and an awesome stash! Any how, since I have too many "squares" in one panel that I purchased (I'll use the term "squares" loosely because my panel has a variety of different square and rectangle shapes) for my original plan, this will be another way for me to use the panel. My Trip squares will have to be bigger so I don't lose the effect/proportion. And I may use more than 5 "replacements." - maybe 9 total adding another in each of the corners, but keeping it asymetrical. 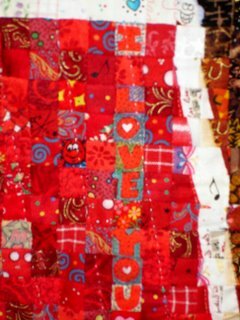 There is no border on this quilt - which is good to see, becasue I have in the past chosen not to add a border & wondered about that choice afterwards... 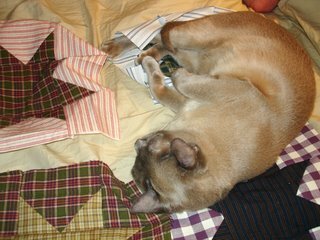 This once again goes to show that the quilt will tell you when it is done. 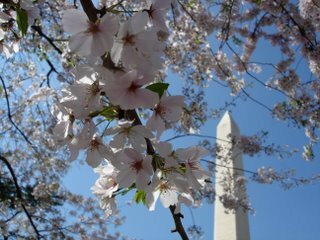 These photos are of soem items that you migth not notice on a casual touristy trip to Washington, DC. 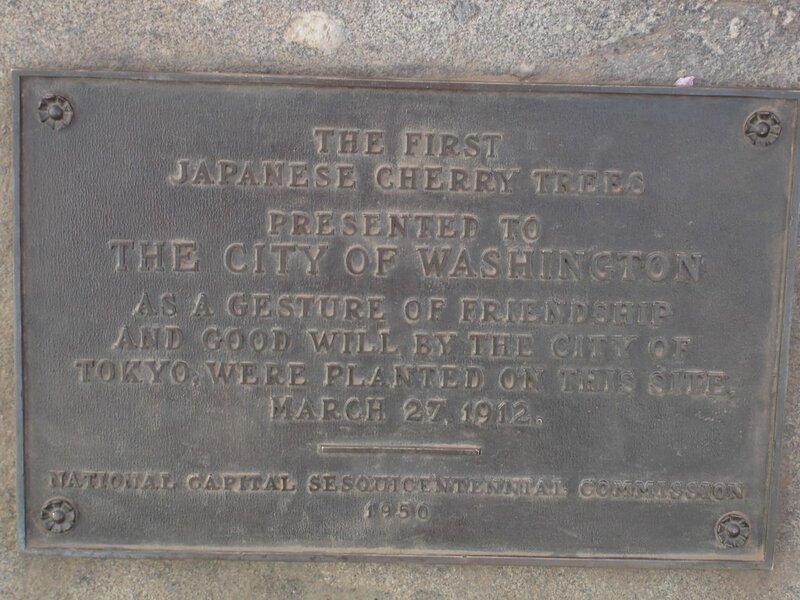 They are a plaque commemorating the 1912 planting of the first two trees planted, a Japanese Pagoda (left) & and a Japanese Lantern (right). Several people asked about my going back to school. For advancement in my job, I need 24 "business" credits. Those can be under several categories from accounting to law... I am starting with a Project Management class (because it fits the guidelines set forth by my job & the time period that I have available for a summer class. You see, our trip to Australia in May coincides with the first summer session) this July and in the fall I will take 1 or 2 pre-law classes. With the big plan being my going to Law School if I like studying law and if I do well in my pre-law classes. 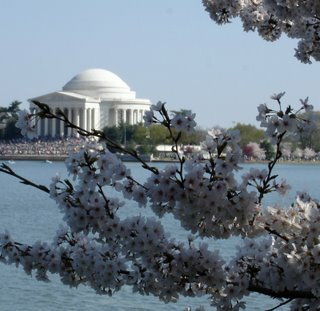 Way back in the early 1990's when I first went to college, I thought I would study computers, I got "C's" in my first two classes, so I figured that was not the career path for me. (Similar scenario in Psychology & Nursing - actually for the Nursing, I did not want to take chemistry - the anatomy & physiology on the other hand I loved!) I ended up with a degree in Elementary Education which was a great fit while I was in college, but once I was in a classroom full time by myself it was HORRIBLE. 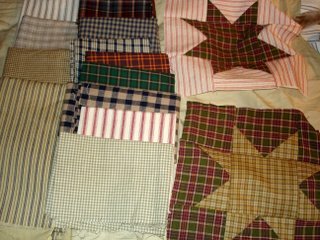 I also got a selection of plaid & striped homespuns.... I know, I know "buy you HATE homespuns!" I need to make a masculine quilt and nothing says masculine more than plaid! 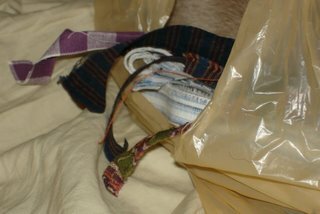 Besides they were only $2 per yard!